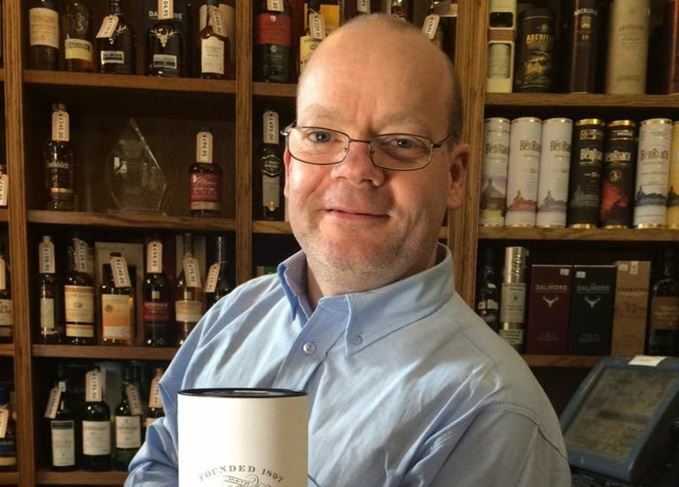 For almost 20 years, Mark Davidson has combined his love of teaching and whisky, and worked with some of Scotland’s best-known independent bottlers and retailers. He spoke to Felipe Schrieberg about growing up down the road from Glen Moray distillery, collaborating with distilleries and how he’s seen the industry change since the late ’90s. ‘I had my secondary years of school in Elgin, a market town in Speyside, malt whisky country, where half the distilleries in Scotland are not so far from you. I lived on the same street as the Glen Moray distillery for five or six years. It was an aspect of life that you didn’t think about as a teenager very much, even though the barley fields were out there, the smell in the air. ‘I believe my great-grandfather worked at Glen Moray, and there was always the smell of whisky on my nose when my dad was watching Scotland getting beaten at some football game. It permeates you and sticks with you. So to end up working with the stuff was pretty much pre-determined. ‘I’m going to be 50 next year and the first time I ever worked in whisky was in 1998, so 20 years next year. I was a barman at the Scotch Malt Whisky Society, which was a great place to be. I didn’t know much then, and still seems I don’t know much now. That’s what’s great about whisky – there’s always something to learn. ‘I was a student teacher when I first started working there, and I was trying to drum into bored teenagers the idea that “y = mx + c”. Then in the evening I found myself tutoring paying customers about whisky. The people I talked to were actually listening, and I found that satisfying. Once I graduated, I found a job at Cadenhead, the independent bottler in Canongate, in the Royal Mile. I was the manager of that shop for 15 years. ‘After 15 years in the one job, as much as I loved it, it was time for a change. Royal Mile Whiskies (RMW) is well-established and it has a different type of philosophy. There’s a bigger team here and more personalities. The stock range is broader than one independent bottler. ‘RMW has the biggest selection of American whiskeys in Edinburgh, and has a great Japanese whisky selection too. We don’t pretend that blends don’t exist, we go beyond the malts, and we have plenty of world whiskies. Other spirits too, as well as beer and wine. If it’s good, we’ll stock it. That was a big draw for me. ‘Our philosophy is to sell good whisky, to find good and interesting whisky, to not rest on our laurels and to take it to people – for example, running events such as the Whisky Fringe each August. There is a love and enthusiasm here for the product. ‘For the staff, working here means you learn the history of the industry, train your nose and palate, and expand your language of taste. At the heart of it is the whisky. Drinking it, promoting it, sharing it, selling it, investigating it, writing about it. We aim to make this fun. ‘We’ve had great success in collaborations with distilleries. We’ve had exclusive bottlings from distilleries such as Tomatin, Balblair, Old Pulteney, GlenDronach, and we’ve just released a bottling from Benromach – we believe it’s the first time they’ve ever done something like this in the UK. It’s great that these distillers are happy to have our name on their product; it tells us that we aren’t doing too badly. ‘The selection of whiskies from distilleries has never been broader and I don’t think it’s ever been better. There is a new level of appreciation and a bigger audience. More companies are turning to 46% abv bottling strengths, as opposed to 40%. Avoiding chill filtration and artificial colouring is becoming more popular as consumers learn more about whisky. Whisky is an emotional thing with value attached to it; people care where their money is going. ‘Over the years, the prices have changed and availability of older whisky was something I knew we were taking for granted. No way a Gordon & MacPhail bottling of 50-year-old whisky at £150 was going to last. Can you believe that the price of Macallan 25 used to be £92.50? Bottles from closed distilleries, even 10 years ago, were the same price as an open distillery. That is a thing of the past. Now they fetch very high prices. ‘When I started there was a bit of a feeling that we were in a wintertime of Scottish whisky, with so many closures in the 1980s. However, today the picture is much rosier. Not only are existing distilleries expanding their operations, but also so many new facilities [are being] built, both large and small. ‘I also run my own tastings and have been doing so for about 15 years. I can say now that we’ve tasted whisky from every single Scotch distillery since Malt Mill closed in 1962. We’ve managed to do the geeky thing of ticking off all the boxes. I happily drink alongside everyone else. Seeing people smile and have a good time, whether it’s friends that come back again and again, or tourists that will only ever come once, is equally satisfying to me. The ‘Jolly Toper’ tells of his love for whisky literature, born in the pre-internet age. Has Scotch whisky become too expensive? Whisky price inflation ignites an inner debate in Royal Mile Whiskies’ Arthur Motley. Isle of Arran has partnered with new Leith bar Nauticus to celebrate the city’s heritage. In a battle of the retailers, Royal Mile Whiskies goes head-to-head with The Whisky Exchange.